COLUMBUS, Ohio—Mitt Romney made a late play for Pennsylvania. Super PACs dive-bombed the state with ads; the candidate made two stops to the state in the last 48 hours of the race. Despite that, the president carried the state by 5 points, similiar to the margin Al Gore won by in 2000. And despite that, this was what happened in Pennsylvania’s House races. 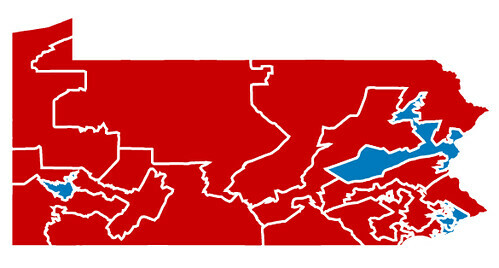 Maybe you can’t tell, but this map, with Republican-held seats in red and Democratic seats in blue, shows the president’s party with five of Pennsylvania’s 18 House seats. * Democrats have been packed into three uncompetitive seats around Philadelphia, an uncompetitive seat in the Lehigh Valley, and a safe seat in Pittsburgh. The state’s suburbs, exurbs, and rural areas have been rigged to be just outside the range where Democrats might win them. Here’s Ohio, a state the president won by 2 points. Same deal. Democrats have been packed into four deep blue districts. Republicans have given themselves the other 12. * They controlled the process in North Carolina and Michigan, and gave themselves similar maps. To be perfectly fair, Democrats played the same game in Illinois and Maryland, squeezing out suburban Republicans by packing just enough of Cook County and Montgomery County, respectively, into their districts. But in states that weren’t very gerrymandered, like Iowa and Colorado and New Hampshire, you ddin’t see a huge divergence between the presidential vote and the House votes. Had some ruthless court gerrymander evenly divided Pennsylvania, Ohio, Michigan, and North Carolina, and had Democrats been able to distribute their votes differently, they could have won up to a dozen more seats, knocking on the door of the majority. I predicted this two months ago, but the ridigity of the gerrymander is more impressive when you see it hold off a minor wave. Correction, Nov. 11, 2012: This post misstated Pennsylvania’s representation in the House. The state has 18 seats, not 13. It also misstated the number of House seats Republicans hold in Ohio. It is 12, not 14.